Every year, Jewish people around the world celebrate Passover. The holiday is a remembrance of the Jewish people’s liberation from Egyptian slavery during the time of Moses. It’s also a feast that is characterized by gratitude, love, and remembering blessings. Does your family celebrate Passover? These books will help make your celebration special. Are you looking to learn more about the holiday so you can broaden your understanding of other cultures? These books about Passover are a great place to start! 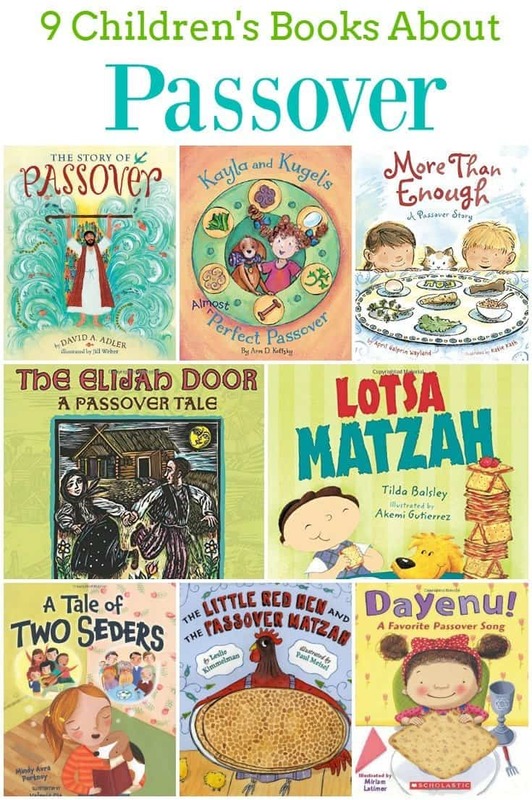 A Tale of Two Seders by Mindy Avra Portnoy — I loved this book because it covered two really important topics: the celebration of Passover, and how blended families celebrate holidays. When her parents divorce, a little girl worries about how life will be different, including how her family will celebrate Passover. The family finds its way over the years, and each celebration is unique and special. The Elijah Door: A Passover Tale by Linda Leopold Strauss — When two families who once shared the Seder begin to feud, the daughter and son of the respective families find a way to be together despite the fighting. This lovely folktale not only shares about the Passover, but also the power of love, and the unity that comes through a shared heritage and experience. The Story of Passover by David A. Adler — Adler may be my favorite author of non-fiction picture books, and this story of the Passover is another home run. It combines gorgeous illustrations with a straightforward telling of the Passover story that is perfect for families of any faith. The Little Red Hen and the Passover Matzah by Leslie Kimmelman — This fun story takes the familiar tale of the Little Red Hen and incorporates the Passover tradition of making matzah. This book is an especially fun read with preschoolers, and can be combined with a baking or tasting activity! The Longest Night: A Passover Story by Laurel Snyder — This gorgeous book follows the story of the exodus from Egypt through the eyes of a young slave girl. An excellent retelling, and one you’ll absolutely want to add to your collection if your family celebrates Passover. Dayenu! A Favorite Passover Song by Miriam Latimer — A traditional Passover song about gratefulness has been turned into a brightly illustrated board book. Perfect for the youngest readers, this book reinforces values we can all embrace, no matter our religious practice. Lotsa Matzah by Tilda Balsley — Matzah is one of the key components of the Passover celebration, and this festive board book explains why. This would be a great choice for young children who may have lots of questions about the elements of the Passover Seder. Kayla and Kugel’s Almost Perfect Passover by Ann Koffsky — Kayla’s dog Kugel is a bit of a disaster during Passover — he makes messes, almost spills the grape juice, and gets tangled in Kayla’s Haggadah. All the same, Kayla loves celebrating with her family and her beloved pet. This book also includes some questions at the end that are perfect for family discussion. More than Enough: A Passover Story by April Halprin Wayland — Another story based on “Dayenu,” this one follows a family as they prepare for the Seder. The book enforces an attitude of thankfulness and blessing as the family buys and prepares food and celebrates together.